I drank a plum sour drink deliciously that I prepared in July, during summer. It is almost finished drinking. 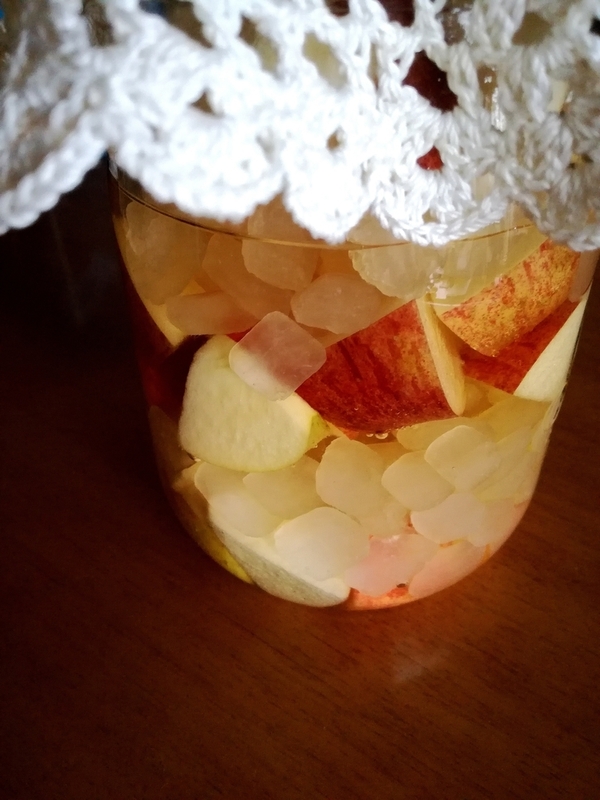 A few days ago, I saw delicious apples at the supermarket, so I have prepared an apple sour drink this time. I tried it for the first time. So I wonder if it will be delicious. Though it was the news on the day before yesterday, it was a very happy news which Japanese tennis player Naomi Osaka won a Grand Slam tournament. She has two nationalities, American and Japanese, grew up in USA and is not good at Japanese. However I am glad that she is playing as a Japanese player. I am expecting her succeed. The summer sweater which I was knitting has completed. It is my favorite that design is uncommon asymmetry. 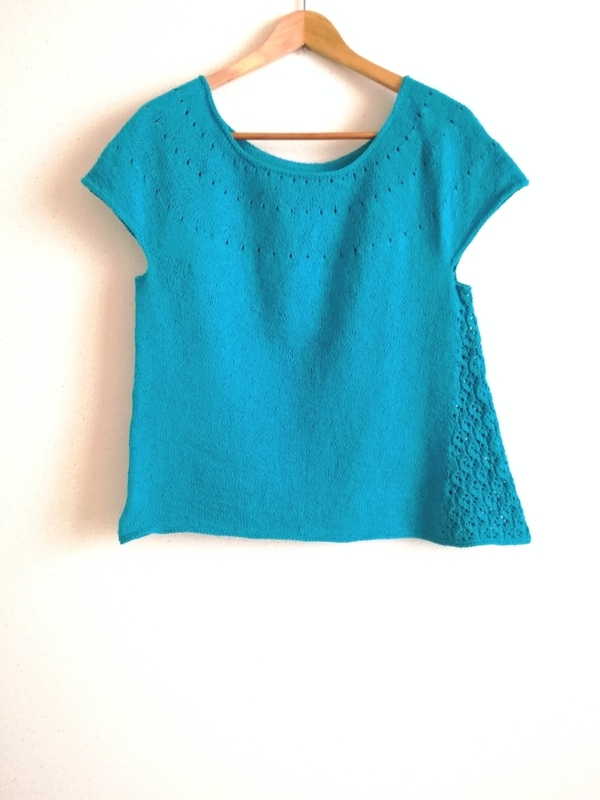 Actually, I wanted to wear it in mid summer, because it was made with summery cotton yarn of turquoise blue. I am going to wear it though it has been already september, because I knit it with effort. And, this pattern is free, fortunately. Much cotton yarn remains which I bought in early summer, so I am going to knit something with it next summer, I think. I miss woolen yarn and want to touch. Next, I should complete socks which I have been knitting from a few months ago. When it will be done, let me show it. A powerful typhoon has came through western Japan. It has strong winds and heavy rains. I saw on the TV news that a car laid its on side due to hit by a gust of wind. And strong winds blew a big tanker into a bridge connected to the Kansai Airport and broken it. I felt scary. I have a takoyaki pan. Several years ago, When I was invited to the takoyaki party at my friend’s house, I was surprised that we could make takoyaki using the takoyaki pan to be nice looking, tasty and easily . And I bought the takoyaki pan immediately for my family. I am always in charge prepareing for ingredient, and my husband is in charge making of takoyaki. When we made them, they were so delicious. Since that day, we almost have eaten takoyaki every Sunday for dinner. We always make yaki-onigiri, they are also tasty. Besides, we can make ajillo, pancake or so on using the takoyaki pan. Our takoyaki pan is working well like that. So it is good I bought it. Figure skater Yuzuru Hanyu has shown practice preview of free-program with song “Origin” for new season. How is the song? I am looking forward to seeing his performance. I was sick because of a cold today, and even I couldn’t roll up and put away into the closet shelf. And I cut a finger by knife when I was cutting vegetable. It was good that it was a slight injury, I think. When I am bad condision, I have to be careful. I go to sleep. Good night. Awesome !! Flying cars seem to be really possible thing. Like a dream thing which I saw on TV when I was childen, it comes true. I thought such a thing was impossible. It is a great technology development. I have caught a cold in spite of summer. I write this blog in English for practice. Sorry I make mistakes a lot.